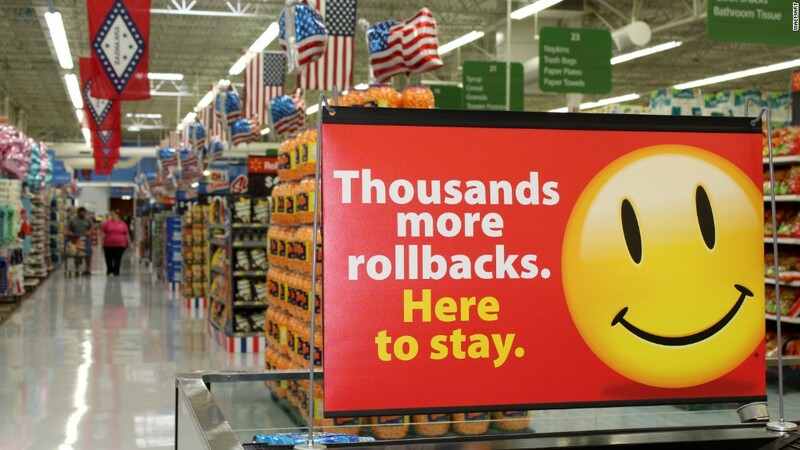 Walmart is making a comeback. Watch out, Amazon? Can anything stop Amazon? Don't rule out a little retailer based in Arkansas. What's its name again? Oh yeah. Walmart. Yes, Amazon hit another new all-time high Thursday. Shares are now up 23% this year. The company's market value is $395 billion. Billion. With a capital B. Just like Bezos. And sure, the Amazon (AMZN) CEO is now worth $70 billion. That's more than Warren Buffett. Jeff Bezos is now the third-richest person in the world, trailing only Bill Gates and Spanish retail titan Amancio Ortega, who runs the company that owns Zara. And its cloud business is gigantic. Companies ranging from publicly traded giants Comcast (CMCSA), Kellogg (K) and Hess (HES) to startups Airbnb, Spotify and Pinterest are all customers of Amazon's AWS hosting unit. The company is even looking to take over the skies as well -- and rely less on UPS (UPS) and FedEx (FDX). There's Amazon drones of course. But the company has also bought stakes in two cargo freight airline companies and now has its own branded fleet of jets. But even though Amazon has a lot of momentum, investors aren't ruling out the possibility that there may be room for Walmart (WMT) in the e-commerce world too. Even though Walmart shocked investors last October by saying that the combination of the strong dollar and wage increases would hurt profits this year, the stock has rebounded sharply in the past few months. Walmart stock is up more than 15% in 2016, making it one of the top performers in the stodgy old Dow. Sales are starting to stabilize at Walmart. The company may have set the bar really low last year when it warned about its earnings too. Profits have topped forecasts for the past few quarters. It even boosted its earnings outlook last month. Walmart clearly has aspirations to be a bigger player in the global e-commerce world too. It recently bought hot online shopping startup Jet.com for $3.3 billion. There are also reports that Walmart may also be looking to make a big investment in Flipkart, an Indian e-commerce unicorn that's currently worth $16 billion. Earlier this year, Walmart also sold its Chinese online marketplace Yihaodian to JD.com (JD) -- the top online retail rival to Alibaba. (BABA) Walmart took a 5% stake in JD.com and will open up an online store for its Sam's Club warehouse brand on JD.com. So it seems that investors are betting that Walmart will be able to capture more growth online. Still, Walmart has a ways to go before it becomes a true online retail powerhouse. Digital sales rose about 12% in its most recent quarter. That's not bad. But it's well below the growth rate for Amazon. We'll get a better sense of just how much momentum Walmart has heading into the holidays when it reports its latest earnings and outlook on November 17. That's just eight days before Black Friday. But it looks like Wall Street thinks there's plenty of disposable income from shoppers around the world for both Amazon and Walmart to have a merry Christmas this year.